A COUNTRY MUSIC LEGEND -- AND LEGENDARY HOT DOGS! … Hank Williams is buried next to his wife Audrey in a cemetery in Montgomery. Hank and his band, The Drifting Cowboys, used to frequent Chris' Hot Dogs, a legendary hot dog restaurant in downtown Montgomery that just celebrated its 95th birthday in 2012! ALABAMA’S STATE CAPITOL BUILDING, THE SPOT FOR IMPORTANT BEGINNINGS AND ENDINGS…the Alabama State Capitol building is the catalyst building that helped shaped our nation’s history. You can witness the spot where Jefferson Davis was sworn in as the President of the Confederate States of America all while seeing where Dr. Martin Luther King, Jr. ended the Selma-to-Montgomery voting rights march of 1965. AN ACT OF COURAGE IN MONTGOMERY SPARKED A NATIONAL MOVEMENT …Montgomery is home to Mrs. Rosa McCauley Parks. Rosa Parks became a Civil Rights pioneer in Montgomery by courageously taking a stand and not giving up her seat which sparked the Montgomery Bus Boycott. Troy University’s Rosa Parks Museum and Library is a tribute to that memorable movement. BASEBALL AND BISCUITS… The Montgomery Biscuits, the AA team behind the Tampa Bay Rays, play at Riverwalk Stadium in downtown Montgomery. The stadium has been among the top 25 coolest minor league baseball stadiums in the country. And the stadium is listed on Man vs. Food for the top 5 baseball stadium foods in the U.S. – the chicken biscuit with Alaga Syrup. CULTIVATING A SUSTAINABLE LIFESTYLE…Hampstead Institute of Montgomery has opened two urban farms within the city limits: the Downtown Farm and the farm at the Town of Hampstead in east Montgomery. Both locations offer residents and visitors the chance to connect with the area’s agricultural heritage, its natural resources and wealth of farm-fresh food. EARLY TEXT MESSAGE THAT CHANGED THE COUNTRY? … on April 11, 1861, President of the Confederacy Jefferson Davis issued the telegraph containing the orders to fire on Fort Sumter. That message was sent from the Winter Building on Dexter Avenue, thus beginning the War Between the States. FLOATING FUN…Montgomery’s Riverboat, the Harriott II, offers cruises for the whole family from dinner cruises to an afternoon blues cruise, even themed cruises for holidays. 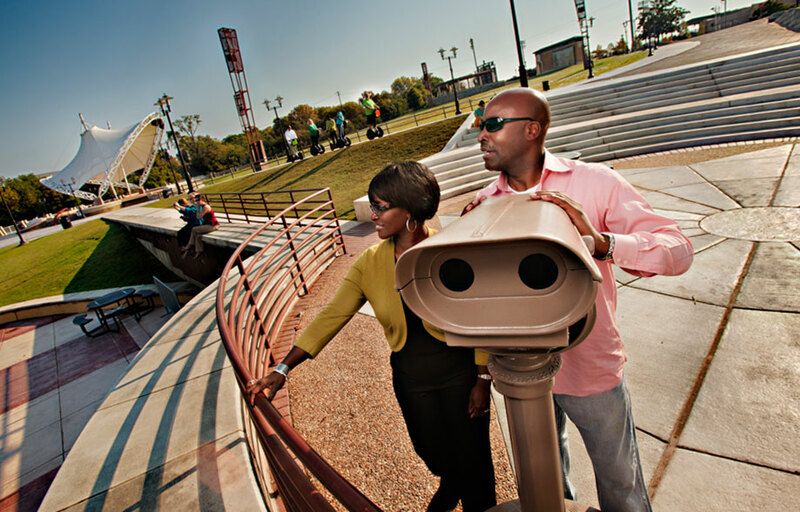 FUN ON THE BANKS OF THE RIVER … Montgomery’s riverfront district offers events for the whole family including musical entertainment at the amphitheatre, AA baseball at Riverwalk Stadium, water fun for the kids at the Splash pad, and much more. HALF OF FAMOUS ‘70s POP DUEO LIVED HERE… Toni Tenille from The Captain and Tenille lived in Montgomery. HAVE A WILD TIME…the Montgomery Zoo houses habitats from five different continents. At the Zoo you can feed the giraffes, take a paddle boat cruise or train ride. And now you can “view the zoo” from atop on a brand new sky lift. Fun events at the Zoo include ZooBrew, Zoobilation, ZooBoo, Ballet and the Beasts and the annual Christmas Lights Festival. HIGH-FLYING FUN…you can try for a crispy tailgrab or an awesome 180 at downtown Montgomery’s River Skate Park. It features a 5-foot mini ramp and a fully stocked skate shop. HIGH-TECH COMMITMENT TO EQUALITY AND JUSTICE…Montgomery’s Civil Rights Memorial and Center houses an electronic “Wall of Tolerance” where you can enter your name to forever become a part of the march for justice. HISTORY LIVES HERE … The First White House of the Confederacy was the home where Jefferson Davis and his family lived while he was President of the Confederacy. The home still contains some of Davis’ belongings from the 1800’s. The First White House still celebrates Davis’ birthday every year in June. HOME OF FAMOUS BROTHERS’ FIRST FLYING SCHOOL … in 1910, the Wright Brothers brought their daring aviation deeds to Alabama’s capital city, establishing the nation’s first school for powered flight. MONTGOMERY LIGHTNING ROUTE FIRST STREETCAR IN U.S. … San Francisco didn't have the very first electric streetcar system. Montgomery was the first city to incorporate the system into its local travel in 1886. MONTGOMERY, AL - GOLF’S HOLE IN ONE … Montgomery is within an hour's driving distance of three Robert Trent Jones' golf trails boasting 468 holes of golf. MONTGOMERY’S MOST FAMOUS SOCIETY GIRL … While on military duty in Montgomery in 1918, F. Scott Fitzgerald fell in love and eventually married Zelda Sayre, a Montgomery socialite who helped inspire many of his most famous works. Montgomery, AL (3/17/15) – On Thursday, March 19, 2015 at 10:00 am the Alabama Department of Archives and History (ADAH) will hold a press event to release newly discovered, unseen film footage of the Selma-to-Montgomery Voting Rights March and recently acquired aerial photographs of the marchers’ departure from their final campsite at the City of St. Jude on the morning of March 25, 1965, and their arrival into Montgomery. The approximately 3,000 feet (run time approximately 90 minutes) of 16mm color and black-and-white film footage was recently discovered during a collections inventory of materials created during the George Wallace administration. It has never been viewed by the public and captures in vivid color powerful scenes from the third and final march in Selma, along Highway 80, and in Montgomery. The aerial photographs were taken by the Alabama Air National Guard and are part of two separate collections recently donated to the ADAH. They show fascinating aerial scenes of Montgomery on March 25, 1965 as the marchers arrive at the Capitol steps. The press event will be held in the ADAH’s Milo B. Howard Auditorium, and all members of the media are invited to attend. Opportunities to view the footage and the photographs will be available. Staff will be on hand for interviews. For additional information please contact ADAH Communications Officer Georgia Ann Conner at (334) 328-9088 or georgiaann.conner@archives.alabama.gov. SEE THE WORLD’S MOST ADVANCED AUTO MANUFACTURING PLANT IN ACTION…at Hyundai Motor Manufacturing of Alabama you can watch one of the nation’s leading safety sedans, the Hyundai Sonata, being made right before your eyes. STAND AT DR. KING’S PULPIT… Dexter Avenue King Memorial Baptist Church was the ONLY church that Dr. Martin Luther King, Jr. ever pastored. STAND IN THE FOOTSTEPS OF AN AMERICAN CIVIL RIGHTS LEADER … in 1965, Dr. Martin Luther King, Jr. ended the Selma to Montgomery Civil Rights March at the Capitol steps just one block away from the only church and pulpit that he ever ministered from. STYX, NOT STONES! … Legendary Styx guitarist Tommy Shaw is a native of Montgomery, honing his chops in several of the nightclubs throughout the city. THE BIGGEST BANG IN THE SOUTHEAST…Bama’s Big Bang at Jubilee CityFest is the largest fireworks show set to music in the Southeast. The event happens in May at Riverfront Park. THE CIVIL RIGHTS MOVEMENT STARTED MOVING RIGHT HERE! … on December 1, 1955, Rosa Parks refused to give up her seat to a white man on a city bus in a move that sparked the Montgomery Bus Boycott, which paved the way for the Civil Rights Movement. THE COOLEST WAY TO HAVE FUN INSIDE…inside Eastdale Mall’s Ice Palace you can ice-skate year round. THE SKY’S THE LIMIT…you can gaze at the stars and the solar system even during the day at the W.A. Gayle Planetarium. THUMBS UP FOR HANDS ON!…The Montgomery Museum of Fine Arts, located in Blount Cultural Park, is home to one of only eight kid’s hands-on museum in Alabama. WELCOMING VISITORS FOR NEARLY 500 YEARS! … Montgomery has lured travelers since 1540, when Hernando deSoto staked a Spanish flag on the banks of the Alabama River. “LEND ME YOUR EARS”…The Alabama Shakespeare Festival is among the top ten largest Shakespeare theatre’s in the world. Its’ location, Blount Cultural Park, is home to many festivals and events such as the Montgomery Symphony Orchestra’s Broadway Under the Stars and the Montgomery Museum of Fine Arts’ Flimp Festival. “UNFORGETTABLE” AFRICAN AMERICAN VOCALIST BORN HERE … Nat King Cole was born and raised in Montgomery.